Next week begins what has become a regular presidential primary tradition: the debates. As a way of previewing them, we decided to look back at the history of primary debates. Readers may be surprised to learn that primary debates existed before the advent of televised general election debates in 1960. 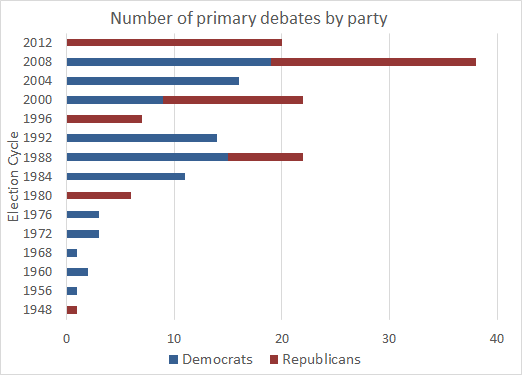 Less surprising is that the number of debates has been steadily increasing over time, although it appears that both parties will have fewer in 2016 than they did in their last competitive primary seasons (2012 for Republicans, 2008 for Democrats). According to several authoritative sources and our own research, there have been 167 Democratic and Republican presidential primary debates, dating back to 1948. The GOP accounted for 73 of them (44%) and the Democrats had a total of 94 (56%). We have a number of observations about the history of these events, followed by Tables 3 and 4 at the end of the article, which list the primary debates we included in this study. The four 1960 general election debates between John Kennedy and Richard Nixon are perhaps the most famous in American history, and they began what eventually became a modern tradition — televised presidential face-offs. While there were no general election debates in 1964, 1968, and 1972, beginning in 1976 the debates became a permanent part of the fall presidential campaign. However, presidential primary debates actually pre-date those held during the general election. Republican presidential candidates Gov. Thomas Dewey (NY) and former Gov. Harold Stassen (MN) held the first modern debate in 1948. The debate, conducted over radio in advance of the Oregon primary, focused on a single question: whether the Communist Party should be outlawed in the United States (Dewey said no, Stassen said yes). Dewey, previously the 1944 Republican nominee, won the nomination again in 1948, losing in a famous upset to President Harry Truman in November. The first Democratic primary debate was in 1956, between former Gov. Adlai Stevenson (IL) and Sen. Estes Kefauver (TN) before the Florida primary. It was the first nationally televised presidential debate, although the reviews for the debate were poor because Kefauver and Stevenson took “virtually identical positions on almost every issue discussed,” as the New York Times reported. Stevenson would become the Democratic nominee for a second straight time in 1956, and the Stevenson-Kefauver ticket would go on to lose in a landslide to President Dwight Eisenhower. Four years later, Kennedy would get some practice for his debates with Nixon in two primary debates — one with Sen. Hubert Humphrey (MN) before the pivotal West Virginia primary, and another with Senate Majority Leader Lyndon Johnson (TX) in front of the Massachusetts and Texas delegations during the Democratic National Convention. Of course, Kennedy won the nomination and chose Johnson as his running mate. Given how many primary debates we have recorded here — 167 total — at first blush it’s hard to think of many classic moments. Realistically, the vast majority of these debates probably meant very little. However, there are some memorable, if not always consequential, moments. Most recently, then-Gov. Rick Perry’s (R-TX) “oops” back in 2011 will be long remembered as a notable blunder, although his candidacy appeared doomed before he failed to remember the third federal department he planned to eliminate (more on that in the next item). During the 2008 race, Hillary Clinton and Barack Obama faced off in what seemed like an interminable string of head-to-head debates — but only four actually featured just the two of them. (Compare that to 2000, when eventual Democratic nominee Al Gore participated in nine separate one-on-one debates with former New Jersey Sen. Bill Bradley.) In thinking back on the Clinton-Obama debates, the most remarkable moment we can recall was during a New Hampshire debate that also featured then-Gov. Bill Richardson (NM) and former Sen. John Edwards (NC). Obama said Clinton was “likeable enough,” in a tone that clearly made it seem like a putdown. During his ultimately successful 1984 battle with Sen. Gary Hart (D-CO), former Vice President Walter Mondale (D-MN) referenced a Wendy’s commercial to question Hart’s policy chops: “Where’s the beef?” he asked. In 1980, former Gov. Ronald Reagan (R-CA) paid for a debate in Nashua, NH, allowing him to declare, “I am paying for this microphone,” aimed at a moderator. The debate was supposed to be a one-on-one clash between frontrunners Reagan and then-former CIA director George H.W. Bush (R-TX), but four other candidates showed up, surprising Bush, who thought it would just be himself and Reagan. The other candidates did not end up participating, leaving just Reagan and Bush to debate, but “Bush was perceived as a poor sport, and his candidacy never recovered,” according to The Primary Decision: A Functional Analysis of Debates in Presidential Primaries, by a group of communication studies professors. While general election debates get much more attention, primary debates can potentially be more influential on the actual voting than general election debates. Why? Polarized party identification means most viewers just tune into general election debates to root for their side, like a sporting contest. But everybody in a primary debate is on the same side as the voters. The primary voters have to make a choice without party ID as a voting cue. Thus, what candidates say and how they say it can really matter. An example, alluded to above, was an early moment in the 2012 cycle. Perry was leading the Republican field at the time when he suggested that the critics of the Texas DREAM Act were heartless, angering illegal immigration critics. By the time his “oops” moment came about a month and a half later, Perry had slipped to fourth and was quickly becoming an afterthought. 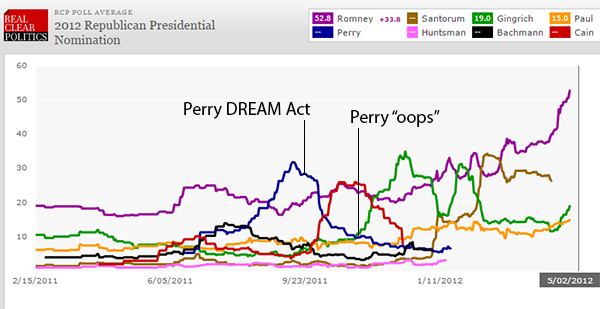 See the chart below from RealClearPolitics — Perry’s DREAM Act defense clearly was a bigger blow than “oops.” However, we should note that it’s probably an oversimplification to attribute his decline solely to the debate, since Perry’s much-ballyhooed campaign was deficient in other respects. Perry’s late start and poor health at the time also contributed to his disappointing effort. More broadly, look at that chart: National primary polls can swing violently, whereas general election polls, especially in this partisan era, tend to be somewhat less volatile. That’s in part because, as we noted earlier, voters don’t have a party cue to rely on in primaries. Writing before the 2000 elections, political scientists Samuel J. Best and Clark Hubbard studied primary debates and concluded, in a chapter of In Pursuit of the White House 2000, that “televised primary debates can exercise considerable influence on voter preferences.” Several recent primary debates reinforce this conclusion. Of the 10 candidates likely to appear at the first Republican debate next week, two will have no prior elective experience: businessman Donald Trump and former neurosurgeon Ben Carson (a third, former Hewlett-Packard CEO Carly Fiorina, might also appear in a future debate if her polling improves). This is not uncommon — many of the presidential debates have featured candidates who had never won an election. Democrats, 1976: Sargent Shriver, the Kennedy brother-in-law who was the Democratic nominee for vice president in 1972 and the first director of the Peace Corps, never won an election for public office. Democrats, 1984 and 1988: Civil Rights activist Jesse Jackson made two high-profile runs for president in the 1980s but has never held public office, unless one counts his one-term stint as a symbolic, unpaid “shadow senator” from Washington, DC in the 1990s. Republicans, 1988: Alexander Haig served as secretary of state and in many other high-level civilian and military positions but never won elected office. Neither did televangelist Pat Robertson, who nonetheless finished second in that year’s Iowa caucuses, ahead of eventual nominee George H.W. Bush. Republicans, 1996: GOP debates that year featured four different candidates who had never won elected office: former White House official and commentator Pat Buchanan; publisher Steve Forbes; frequent candidate and conservative activist Alan Keyes (Keyes would later lose to Barack Obama in the latter’s 2004 Senate election); and businessman Morry Taylor. Republicans, 2000: Forbes and Keyes participated in debates, as did former Reagan administration official and conservative activist Gary Bauer. Democrats, 2004: Civil Rights activist Al Sharpton was a candidate but has never won an election; neither had dark horse candidate and retired Gen. Wesley Clark, former commander of NATO. Republicans, 2012: Businessman Herman “9-9-9” Cain, who rode some well-received debate performances to a brief lead in national polls in late 2011 before dropping out of the race due to stories about his alleged marital infidelity. None of these candidates lacking electoral experience came close to winning their party’s nomination. The last presidential nominee who had not held elected office prior to winning the presidency was Dwight Eisenhower, a national hero who had brilliantly commanded Allied forces in Europe during World War II. No sitting president has participated in a primary debate, despite the fact that several incumbent presidents have faced major primary challenges in the debate era. Unelected President Gerald Ford did not debate Reagan during the latter’s nearly-successful challenge in 1976. Nor did President Jimmy Carter debate Sen. Ted Kennedy (MA) during the latter’s high-profile bid in 1980. More recently, President George H.W. Bush did not debate Buchanan in 1992. While Buchanan did not come close to winning the nomination, his strong performance against Bush in the New Hampshire primary proved to be an ominous sign for the incumbent, who lost to Clinton later that year. Since 1972, every non-incumbent major party presidential nominee has appeared in a primary debate, and many of these nominees participated in all or nearly all of the contests included on our list. However, frontrunners do occasionally skip early debates. Reagan passed on an Iowa debate in 1980 only to see George H.W. Bush beat him in the caucuses there, setting up the microphone moment in New Hampshire. George W. Bush passed on the first few debates in the 2000 cycle but ended up steamrolling to the nomination, despite his landslide loss to Sen. John McCain (AZ) in New Hampshire. The Crystal Ball team — and, we suspect, much of the political world — has had more leisurely weekends than Jan. 7-8, 2012, when that debate-laden Republican primary season featured GOP debates on consecutive days in New Hampshire, one in Manchester on Saturday night followed by a morning debate in Concord. We were surprised to find that such a punishing schedule was not unique to 2012. On the Republican side, 2000 and 2008 also included debates conducted on consecutive days. Similar to 2012, the 2008 debates were both in New Hampshire, while the 2000 back-to-back debates were in New Hampshire one day followed by South Carolina the next. The Democratic side also featured these grueling back-to-backs: Texas followed by Minnesota in 1988; two Brown-Clinton debates on consecutive April days in New York City in 1992; and, incredibly, a Saturday, Feb. 29, 1992 debate in Colorado followed by a Sunday, March 1 double-header in Georgia and Maryland. The three states represented “the major prizes in a crucial round of primaries and caucuses” the following Tuesday, according to the Los Angeles Times. The triple-decker of debates preceded a three-way split result: Clinton won Georgia, Brown won Colorado, and former Sen. Paul Tsongas (MA) won Maryland. As of now, there are no back-to-back debates scheduled for this cycle. For our own mental health — and for the sanity of the candidates and their staffs — we hope it stays that way. 8. Where have the most primary debates taken place? Unsurprisingly, the first two states in the primary and caucus process — Iowa and New Hampshire — have hosted the most pre-nomination debates. Granite State sites have held 35 versus the Hawkeye State’s 23. Next in line is South Carolina, which checks in at 16 debates. Outside of the early states, the other three states in double digits are California (14), New York (11), and Florida (10). Digging deeper into the data, what about the cities and/or metropolitan areas that have held the most debates? First place is Des Moines, IA: the state capital and its suburbs have hosted 20 debates. Following closely behind is Manchester, NH, and its environs with 18 debates. The only other city to host more than 10 debates is New York City, which has hosted all 11 of the confabs to take place in the Empire State. Do the parties have favorites? 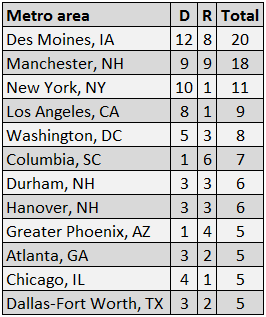 Des Moines has held the most Democratic debates (12) and the second-most Republican debates (eight). Manchester has hosted the most GOP sparring sessions (nine). Second among the Democrats is New York, which has hosted 10 Democratic debates. Los Angeles has also held a large number of Democratic debates, with eight having taken place in its environs. Third among Republican sites is Columbia, SC, which has hosted six debates. Until the 1988 cycle, there were no debates prior to the calendar year of the presidential election. However, since 2004, a majority of primary debates has occurred before the New Year. This has partially been a result of an earlier primary schedule, but also the increased, lengthier media attention on the process. Campaigns seem to be getting elongated across the board, and the presidential primary season is no exception. 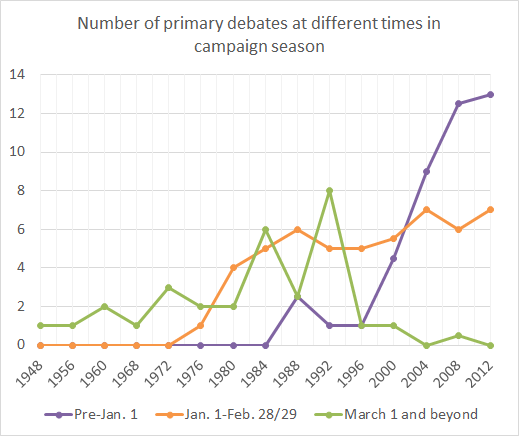 Below is a line graph (Chart 2) of the number of debates by time of year (or an average if both parties held debates). Note: Data for 1988, 2000, and 2008 are averages of the Democratic and Republican totals as both parties held debates in those cycles. We can see an obvious increase in the number of face-offs taking place the year before a presidential battle. The most extreme example occurred on the Democratic side at the start of the 2008 presidential cycle, when eight Democrats sparred in Orangeburg, SC on April 26, 2007 — the earliest any primary debate has happened. As the timing of primaries and caucuses has moved forward and conventions have ceased to be the actual decision points for party nominations, the number of debates taking place beyond March 1 has dropped to nearly zero in the five most recent cycles. Given the lengthy primary battle between them, it is surprising Clinton and Obama only had one head-to-head debate after March 1 in the 2008 cycle (in Philadelphia on April 16, 2008). And although Mitt Romney did not clinch the delegate total necessary for his nomination in 2012 until May 22 of that year, there wasn’t another debate after the Feb. 22 competition in Mesa, AZ. In terms of total debates, the open-seat presidential years of 1988, 2000, and 2008 saw the most as both parties held numerous candidate clashes. Chart 3 details the totals. Besides those three cycles, the only other one to have at least 20 debates was 2012, when the GOP primary alone featured 20 debates. No wonder the RNC sought to limit the verbal gymnastics this time around. Overall, Democrats have averaged nearly five candidates per debate, while Republicans have averaged about six. But as shown in Chart 4, there isn’t really much of a pattern once we enter the McGovern-Fraser primary reform period (starting with the 1972 cycle). 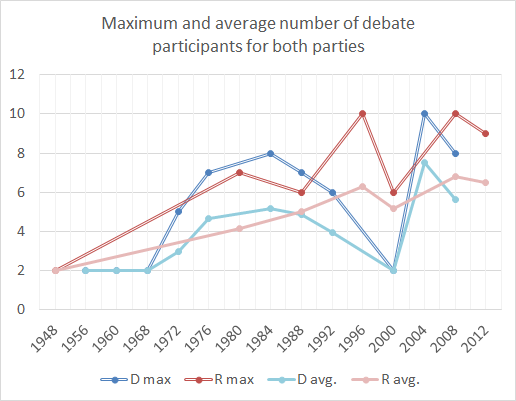 The graph lays out the average number of participants in debates as well as the maximum number to appear in any debate that cycle. Most striking is the fact that no debate for either party has ever had more than 10 participants. Republicans had debates in 1996 and 2008 with 10, and Democrats joined them in 2004. Given the 10-candidate limit imposed by the cable networks for the initial primetime Republican debates this cycle, the record high will not be broken, for the moment. Should any network prove brave enough, the large GOP field could fill a debate stage with more than 10 participants. Interestingly, although the Republicans had a radio debate in 1948, the GOP wouldn’t hold another confab for 32 years. But from 1980 to 1996, there was a steady increase in the average number of Republican participants in years where the party had debates, including the first instance of 10 candidates in the first debate of the 1996 cycle in October 1995. Since then, the average and maximum number of debate participants has vacillated up and down. On the Democratic side, the average number of candidates in debates increased up until 1984, a cycle where the maximum number of candidates on stage was eight. But Democrats’ debate participant figures sagged after that, falling all the way to just two for all nine of the party’s debates in 2000 as Gore and Bradley were the party’s only major candidates. With the potential challenge of facing George W. Bush, a record 10 Democrats appeared in one debate during the 2004 cycle and the party of Jefferson and Jackson (well, kind of) averaged 7.5 participants per debate that year. But the Democratic totals fell off again in 2008, maxing out at eight again, with an average of 5.6. With that, here’s our list of the 167 presidential primary debates from 1948 through 2012. For information on how we built this list, see the notes below the two tables. Notes: For debates from 1948-2000, we used lists from The Primary Decision: A Functional Analysis of Debates in Presidential Primaries and In Pursuit of the White House 2000: How We Choose Our Presidential Nominees. For debates from 2004 through 2012, we used The American Presidency Project at UC Santa Barbara and our own research. Particularly for the last three cycles, we made some judgment calls about which debates to include or exclude; generally, if the debate was televised and included at least some of the leading candidates, we included it on our list. If you believe we are missing a debate or have other comments or questions about how we built this list, please e-mail us at goodpolitics@virginia.edu. Taylor Hardin, an Alabama state official, stood in for Gov. George Wallace (D-AL) during a 1972 Democratic debate. Sources: The American Presidency Project at UC Santa Barbara; The Primary Decision: A Functional Analysis of Debates in Presidential Primaries; In Pursuit of the White House 2000: How We Choose Our Presidential Nominees; Crystal Ball research.